We’re fortunate to be engaged as GIS professionals today. Never before has there been so much potential to transform the work we do and the organizations we serve geospatially. What do we need for this transformation? We need authoritative data at a variety of scales – local, regional, and national. We need tools that can integrate data from many sources, and bring it together in meaningful ways. We need analytic capabilities that can help us glean every drop of valuable information that we can from these sources, and gain previously hidden insights. And we need ways to enable broader access to our work, foster collaboration among our peers and stakeholders, and facilitate public engagement when needed. Today, we’re lucky enough that we actually have all these things. And these capabilities are continuing to evolve rapidly. Recently Bill Meehan, Esri’s director of utility solutions, told me a story about a potential client that he had visited, one not currently using GIS. One of the corporate executives there told Bill about how they were embarking on a large project to meet customer needs and improve efficiency and infrastructure. It was a costly project that would last for years into the future. Many years ago I worked with ARC/INFO, Esri’s first software package. I sat at my desk in front of an ASCII terminal to type commands at the ARC: prompt, the only way to perform a task. 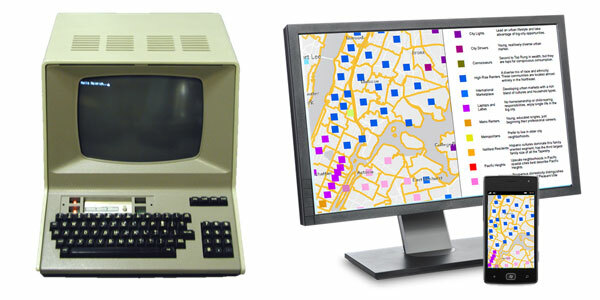 It was software installed on a minicomputer in a back room that long ago vaporized from the Esri campus. Today, I think of ArcGIS as much more than software. It’s a platform. A platform we can use to turn simple geography and location into something more powerful and meaningful – geographic understanding. We use this platform to discover the how and the why from the where, and to share and communicate that knowledge with others. What’s a platform in this context? I struggle a bit to define that exactly, but I can identify its characteristics more easily. Platforms serve many communities; GIS serves utilities, health care, local government, conservation, public safety, education, business, and many others. Platforms can be used by many different people; professionals, knowledge workers, developers, and information consumers. Platforms include applications, data, services, and APIs. Platforms can be used by individuals, workgroups, organizations, and even entire governments. A platform provides a base upon which developers can build, leveraging core characteristics and components to create unique solutions. A platform supports a variety of ways to implement or experience it, in the cloud, on your desktop, via servers, and on mobile devices. That’s how I think of the ArcGIS platform – a complete ecosystem that incorporates the many facets mentioned above. We use it to turn geography into geographic understanding, and to share that understanding with others. What’s our challenge after that? Our challenge as GIS professionals and organizations is to turn that understanding into action.